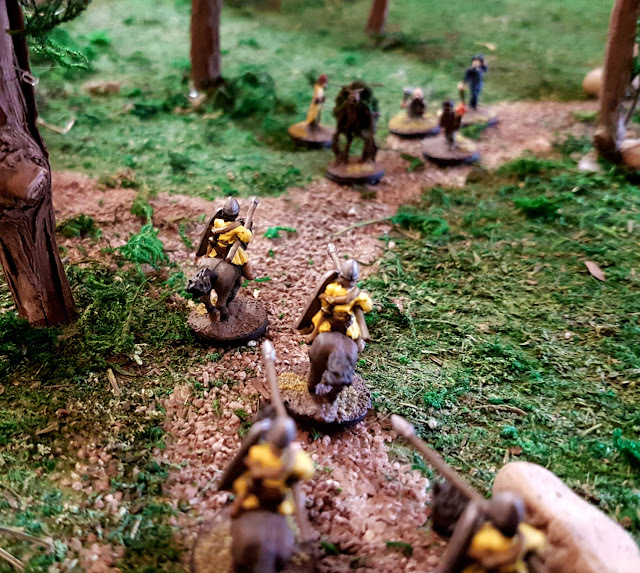 In game 18 of Arachnophobia the party encountered a group of guards on horseback that rode into the town of Penkurth. They were lead by the cruel Sir Gavriel de Ponce and brandished a warrant of arrest for the party. 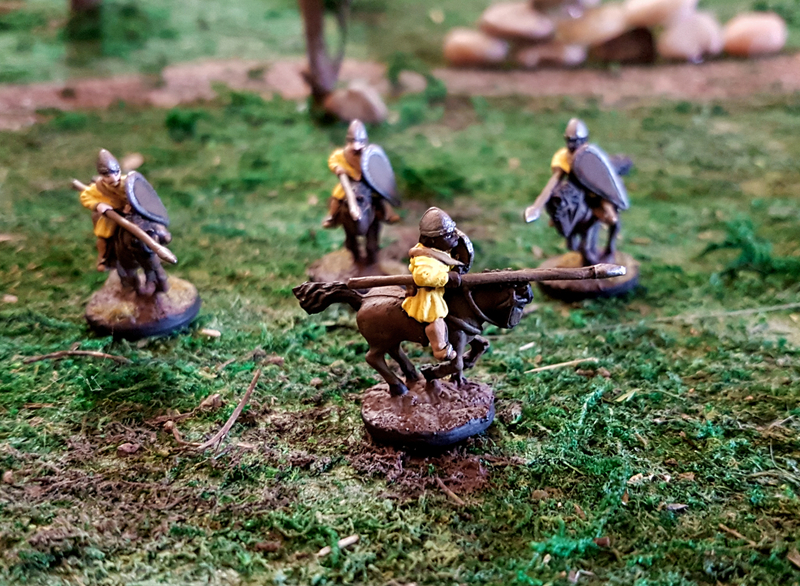 I readied these horsemen in the event the party tried to flee Penkurth. If that was the case - I planned to ride them down as they fled. The battle however happened on foot and in town foot during an event that we have come to call The Penkurth Massacre, and so they were never used. 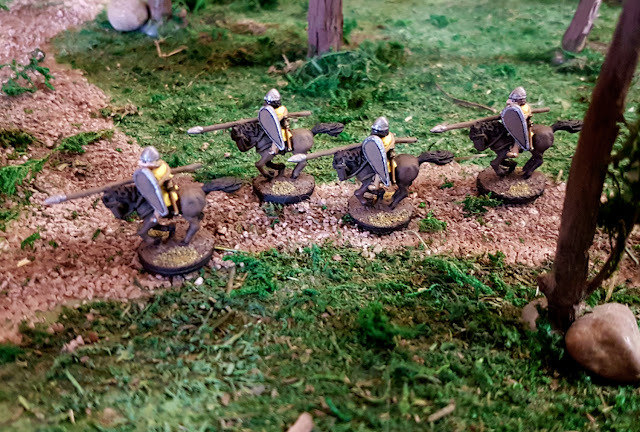 I painted these guys using the same style that I painted my 15mm Guards: with yellow cloth, silver armour and wooden shields. Now in retrospect, on these guys the colour is a little bright and overwhelming, and I would figure out where to paint a few more accents if I were to paint them again. The reason I chose the colour yellow to signify my Guards is two fold. First it means they stand out from the crowd, making them nice and obvious when setting up a complicated miniatures scene, so the players have a clear view when the battle starts. Secondly not many players choose yellow for their character's colours so there are no conflicts. It is not the greatest colour, but it serves well and in Arachnophobia has become the House colours of the evil Count Opplethor. 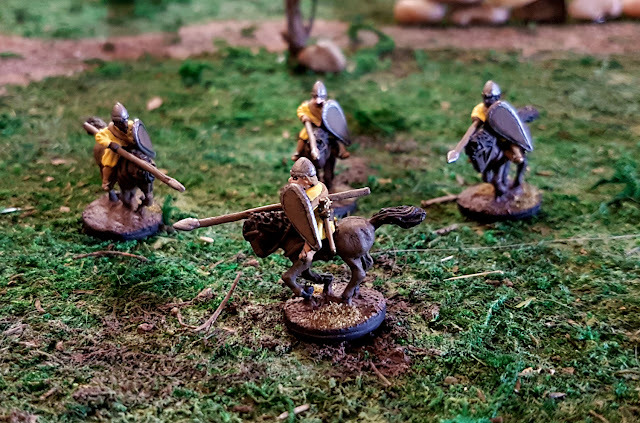 These minis are from Alternative Armies and are interestingly one solid piece. Most 15mm riders I have seen come with a horse and separate rider making these stand apart from the rest.